This dinner is for the nights you crave Chinese take out but could do without the MSG hangover. There's nothing tricky or time consuming about the preparation, and using one wok (or heavy skillet, if you don't have one) means an easy clean up. 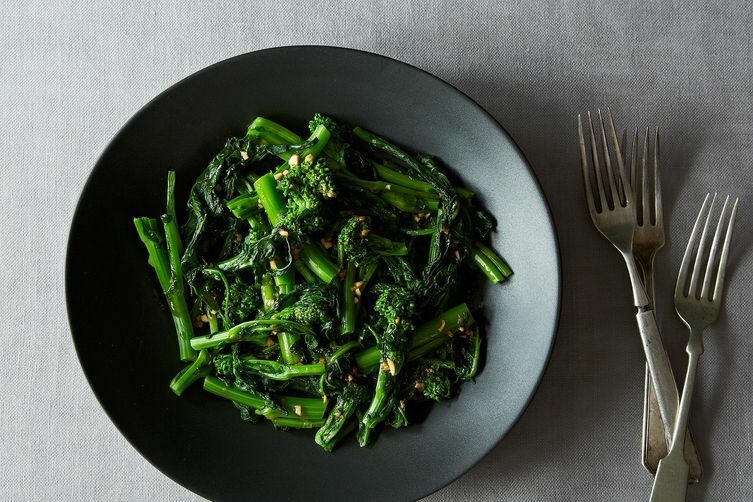 Feel free to make any adaptions if needed: broccolini will work just as well as Chinese broccoli, and so will regular basil in place of Thai. Some warm rice would hit the spot with these dishes, but it isn't necessary. Just make sure to have a pair of chopsticks handy -- the only thing you'll miss is your fortune. We're assuming you have some garlic, a medium onion, 1 teaspoon sugar, and 1 teaspoon Sriracha. If not, add those to your shopping list, too. 2. Trim ends from Chinese broccoli, then cut in half crosswise, separating the leaves from the stalks. If any stalks are thick, cut them in half lengthwise. 3. Heat about 1 inch of water in a large, lidded pot or wok, then bring to a boil. Lay stems in an even layer in the boiling water and place the leaves across the top. Cover and let steam for 3 to 5 minutes, until it has reached your desired tenderness. 4. With a slotted spoon, transfer broccoli to ice bath. While the broccoli cools, prepare the dressing. Combine garlic, ponzu sauce, and Sriracha in a small bowl, then slowly drizzle in the sesame oil, whisking constantly. Set aside. 5. Using a slotted spoon, transfer the cooled broccoli to a serving bowl. Pat dry with a clean kitchen towel or paper towels. Drizzle dressing over broccoli and toss to coat evenly. 6. For the chicken and cashews: Mix the fish sauce, oyster sauce, light and dark soy sauce, 1 teaspoon sugar, and a splash of water. Stir to dissolve. 7. Heat the wok on medium to high heat for 20 seconds. Add 3 tablespoons oil and swirl the wok/frying pan so that the oil is evenly distributed. Add minced garlic and fry for 10 seconds. Quickly add minced chicken and continue frying until chicken turns white. 8. Pour the sauces into the chicken and mix well. Add the basil and fry for another 30 seconds. If the chicken looks dry, add a splash of water. Throw in the cashew nuts and turn the flame off. 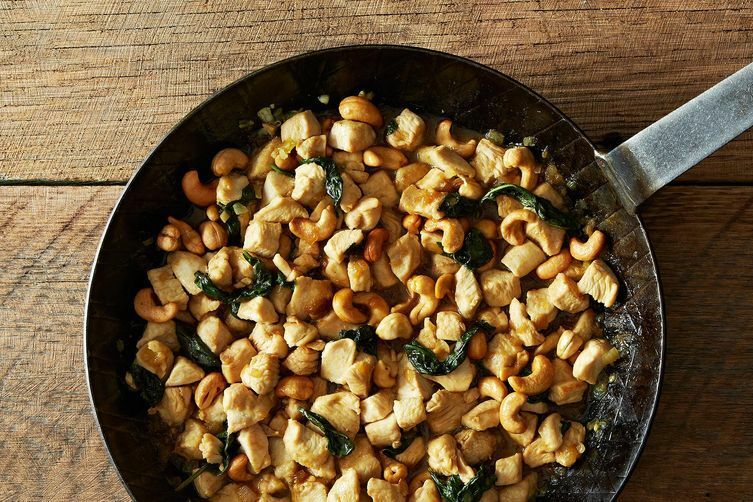 Stir the cashew nuts into the chicken. Serve and enjoy! Writer, Fooder, Blogger. New Yorker turned Cape Coder. MSG hangovers are the worst kind!